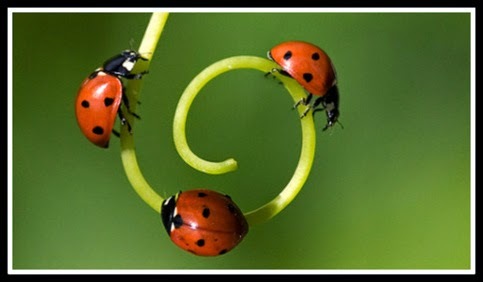 Ladybirds are a gardener's friend as they love to eat the greenfly that try to eat our crops. 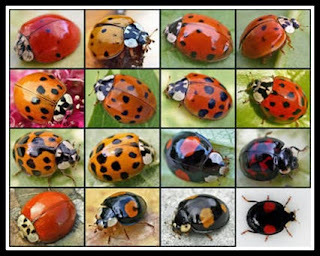 The 46 resident types of British ladybirds are under threat from the invading harlequin ladybird that arrived in Britain in 2004. Read on to find out a bit more about ladybirds, how you can help smart scientists do research into British ladybirds and discover some ladybird inspired crafts you can do at home. I bet ladybirds on flowers don't look as pretty to aphids! They aren't just red, yellow, orange or pink types exist too. The number of spots on spotted varieties varies between 2 and 24. Only 26 of the 46 British ladybirds are recognised by their bright, spotty appearance, others are less colourful and even stripey. Male ladybirds can eat up to 40 greenfly a day but female ladybirds are really greedy and they can eat up to a whopping 75 greenfly a day! They scare off any creature who try treat them by making a yellow smelly, oily liquid from their back legs called reflex blood- YUCK! A hundred years ago people thought that if a Ladybird alighted on your hand you would get new gloves, if it landed on your head you'd get a new hat.....Mummy says she is going to try gently place some on her feet so Daddy buys her some new shoes!! Two hundred years ago some doctors used Ladybirds to treat measles! They also believed that mashed ladybirds (ewww!) could cure toothache !! There have been loads of ladybirds around recently but they are about to disappear. Don't worry though as they will be back in late summer. Wow, ladybirds change almost as much as caterpillars! Between October and February most ladybirds with be having a good long sleep- they're just sensible and avoiding the worst of our Scottish weather. You'll see loads of them feeding on their favourite dinner in March to May. 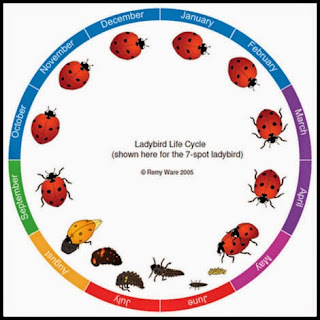 Hungry baby ladybirds are born in June and July and these also eat loads greenfly before sleeping again from Autumn. Scientists are trying to find out what types of ladybirds we can see in the UK, how many of each and where they live. We aren't very good at recording ladybird sightings in Scotland, so I'm definitely going to get involved. You can report your results of what you saw, where and when here. The website also has useful information on how to identify the bullying harlequin type . It is quite tricky to spot (spot, get it?!) harlequin ladybirds as there are lots of different harlequin varieties. 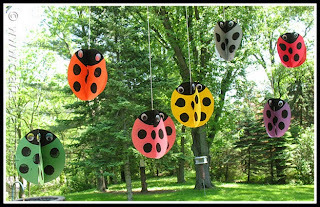 If you fancy having some ladybirds around you all year, I've found several craft ideas you can have a go at. You could make another paper plate ladybug like the one I blogged about last year. These really cute ladybirds are actually painted on old golfballs. I never knew ladybirds could fly! Method available here. If you want some indoor ladybirds you could make your own apron for cooking, baking or crafting. My Auntie Alison made this cute apron using fabric called Luv bug. She cut out one apron piece in the ladybird fabric and another in a plain lining cotton. She also cut 2 rectangles (15 x 22cm) of the same 2 fabrics to make a pocket. She sewed the apron pieces as well as the pocket pieces with right sides together, leaving a little gap in order to turn them the right way out. She reversed the apron right side out, also reversed the pocket, ironed the pocket then she sewed pocket onto apron. Then she sewed bias binding all the way around apron. She used some cotton tape for the waist (2 lengths of 45cm) and neck ties (60cm) and she added a little popper at the neck to make it easy to remove when all messy. It is true, you can get orange or pink ladybirds!! If you love the apron but don't fancy sewing it yourself you can get Granny Biscuits Clothing to make one in any size and lots of different fabrics instead. So look out for ladybirds, help record what they are up to in Scotland and maybe grow some of their favourite plants (such as cosmos, chives and marigolds) to ensure they come back to help out in your garden soon.